Franz Beckenbauer, who headed Germany's 2006 World Cup organising committee, said on Monday a transfer of 6.7 million euros to world football's governing body FIFA in 2005 was a mistake but rejected claims it was a return of a loan to buy votes in favour of the country's World Cup bid. "In order to get a subsidy from FIFA (for the organisation of the 2006 World Cup) those involved went ahead with a proposal from the FIFA finance commission that in today's eyes should have been rejected. I, as President of the then organising committee bear the responsibility of this mistake." But he said any claims of a votes-for-cash deal were not true. "There were no votes bought in order to get the nod for the 2006 World Cup," Beckenbauer, 70, said. Der Spiegel magazine had reported an alleged slush fund of 6.7 million euros was used to buy votes for Germany. The money had been provided by then Adidas CEO Robert Louis-Dreyfus, the magazine said. The German Football Association (DFB) has rejected the claims as groundless but has said it was investigating a payment of the same amount from the organising committee to FIFA in 2005. DFB President Wolfgang Niersbach, who was vice president of the 2006 World Cup organising committee, acknowledged last week there were unanswered questions surrounding that payment, saying the money was demanded by FIFA's finance committee in order to pay out a contribution of 170 million euros towards the Germans' organisational budget. When asked why the Germans have to pay FIFA a small sum to unlock a payment for them that was much larger, Niersbach, a vice-president of the organising committee back in 2005, said he did not know. Der Spiegel claims the 2005 payment to FIFA was repaying Louis-Dreyfus for his loan five years earlier through the football body. Niersbach's predecessor Theo Zwanziger has also said there was an alleged slush fund. Niersbach has been invited to appear before Germany's parliamentary committee on sports on November 4 but has yet to say whether he will go. Germany's soccer chief must urgently appear before a parliament committee to answer allegations of slush fund payments to secure the 2006 World Cup, and to tackle a scandal that threatens to damage the sport in Germany, MP Oezcan Mutlu said on Monday. "There are questions after questions that have remained unanswered and that is not contributing to the clearing up of what exactly happened with our "Sommermaerchen" (summer fairy tale)," said Green Party MP Mutlu, echoing a term used to describe an outpouring of enthusiasm among Germans around the tournament that year. The allegations, besides shaking German soccer, have fueled a deepening crisis over the running of world soccer, whose governing body FIFA is the target of corruption investigations in Switzerland and the United States. Mutlu, a member of parliament's sports committee and long-standing critic of FIFA, told Reuters German football association (DFB) head Wolfgang Niersbach had not responded to an invitation to appear before the committee on November 4. "My goal is that he comes and answers our questions. Full transparency," Mutlu said. "If he does not come, then the suspicions will only grow stronger and will damage the sport." The DFB refused to comment when repeatedly contacted by Reuters on the invitation to the hearing. The DFB boss has been invited to respond to allegations from both media and his predecessor, Theo Zwanziger, that a slush fund containing 6.7 million euros was used to buy votes backing of Germany's 2006 world Cup bid in 2000. Der Spiegel magazine said both Niersbach, a vice president of the organising committee at the time, and Franz Beckenbauer, a former World Cup-winning player and coach who headed Germany's World Cup organising committee, allegedly knew about it. "And at the heart of it all, Franz Beckenbauer, the Kaiser, remains silent," Mutlu said. Beckenbauer, one of the great sporting heroes of Germany, issued a brief statement more than a week ago denying the allegations but has not spoken since. 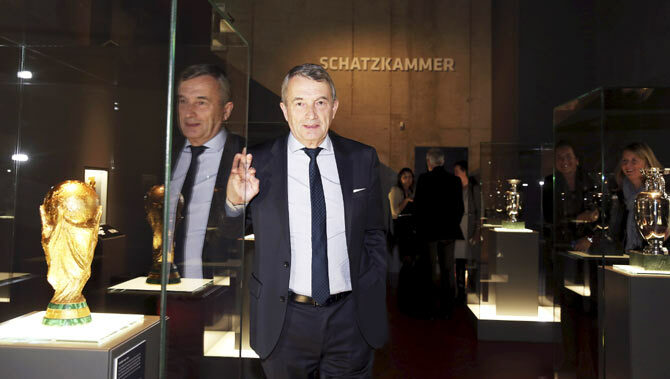 Niersbach also denies any wrongdoing but the DFB president has confirmed the association is investigating a transfer of that amount to FIFA in 2005, raising further speculation. "With the ongoing revelations in the media there is the feeling that the FIFA scandal has now firmly arrived at the DFB," Mutlu said. "We can now also talk about a DFB scandal." "Don’t forget that there was also tax money invested in the World Cup...so, for this reason, we as politicians have the obligation to ask these questions and demand full transparency."